Goalkeeper Dimitrios Konstantopoulos has signed a new one-year contract with Championship side Middlesbrough. 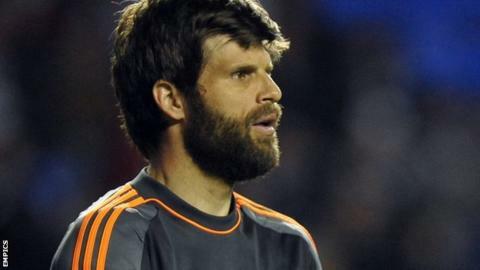 Konstantopoulos, 35, initially joined the Teessiders in August and, after extending the deal in January, made 13 league and cup appearances. "We were speaking with Dimi and he is happy here and playing well," Boro boss Aitor Karanka told BBC Tees. "I'm very happy with him. He has worked hard every day, trained 100% and he had his opportunity and played very well." The former Hartlepool United goalkeeper, who also played for Coventry, Nottingham Forest, Cardiff and Swansea, joined Boro after his release by AEK Athens in his native Greece.